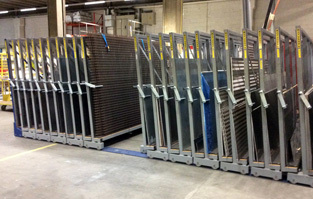 40" x 72" RML 72 80" 43" 2,5" 1320 lbs 6 - 25 66" - 174"
48" x 96" RML 96 99" 51" 2,5" 1100 lbs 6 - 25 66" - 174"
60" x 120" RML 120 119" 63" 2,5" 880 lbs 6 - 25 66" - 174"
60" x 120" RML 120-1T 119" 64" 3" 2200 lbs 6 - 25 69" - 179"
72" x 144" RML 144-1T 159" 85" 3" 2200 lbs 6 - 25 69" - 179"
40" x 72" RM 72 80" 45" 5,5" 5500 lbs 6 - 20 87" - 263"
48" x 96" RM 96 100" 44" 5,5" 5500 lbs 6 - 20 87" - 263"
60" x 120" RM 120 119" 52" 5,5" 5500 lbs 6 - 20 87" - 263"
72" x 144" RM 144 159" 85" 5,5" 5500 lbs 6 - 20 87" - 263"
"storage of sheet metals up to 4000 mm." 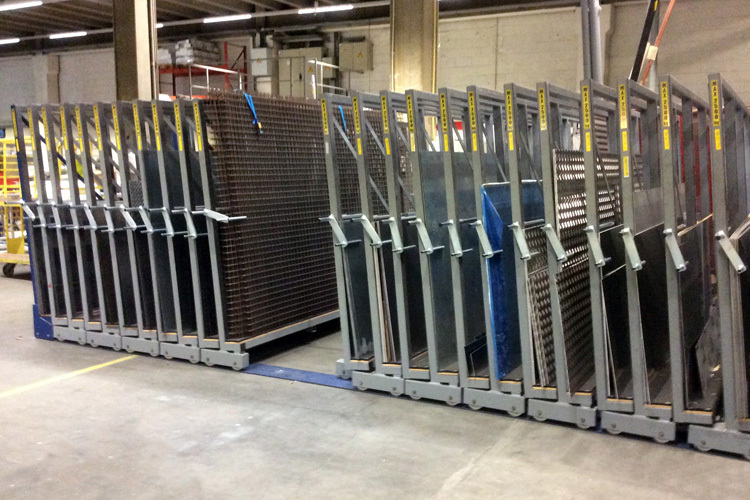 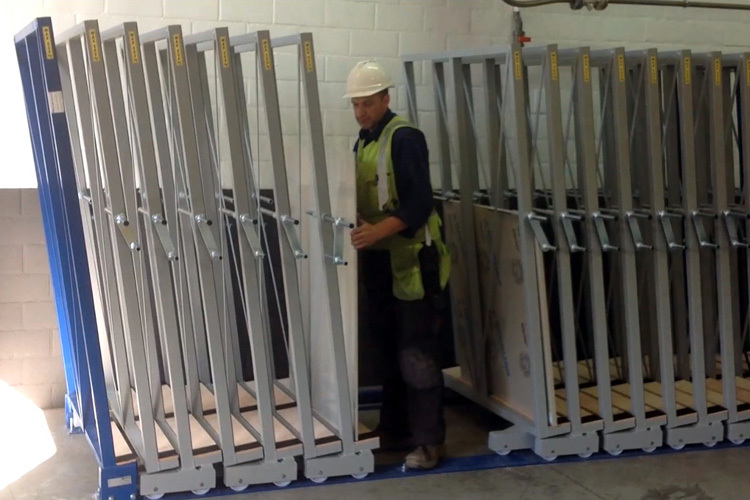 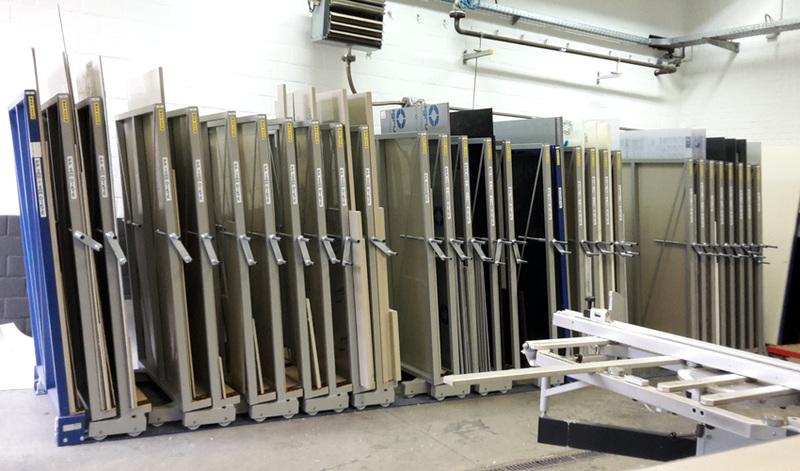 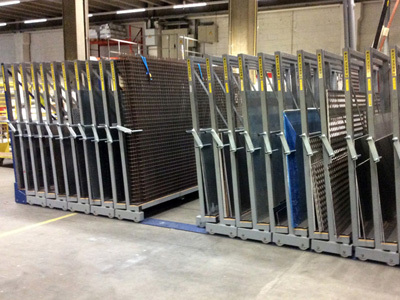 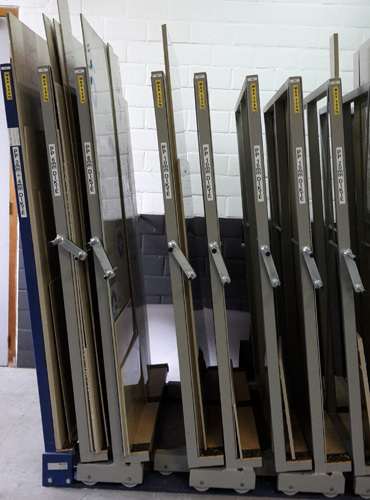 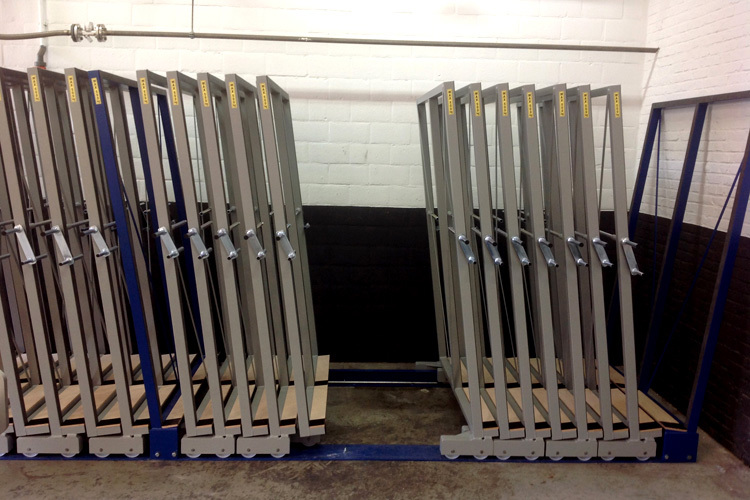 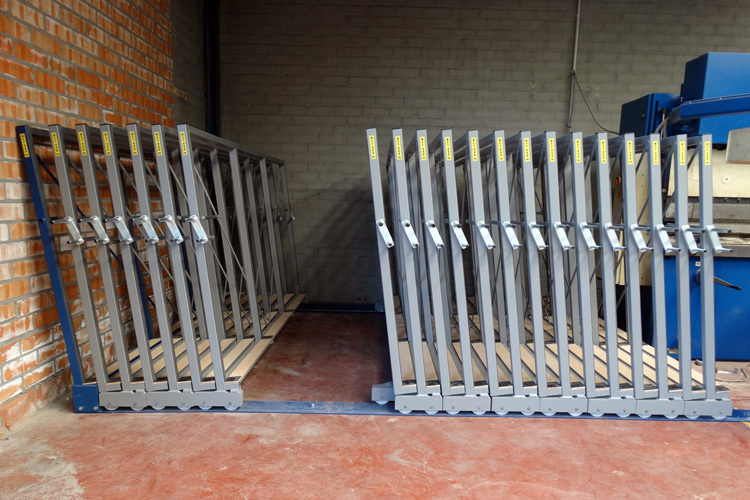 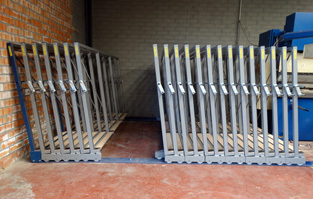 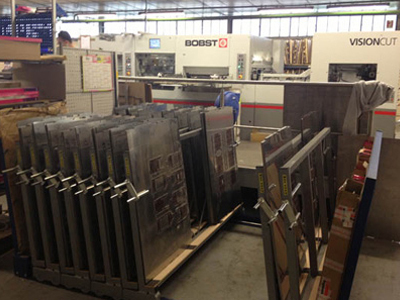 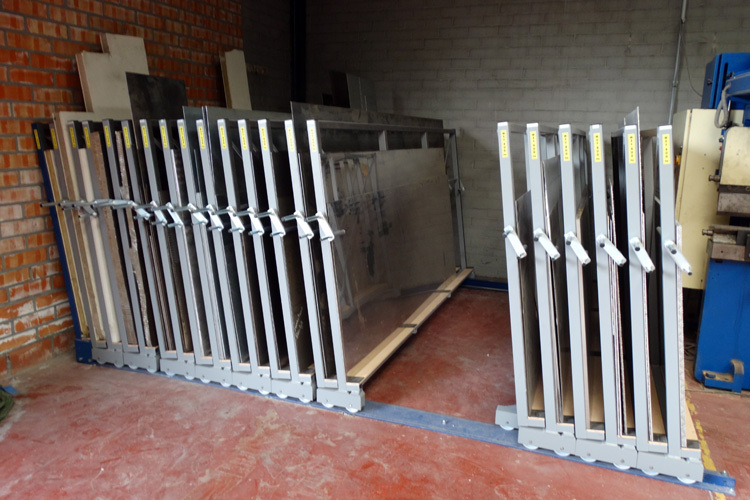 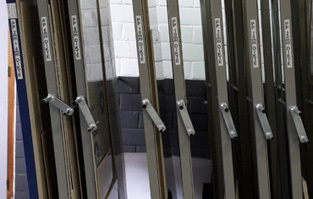 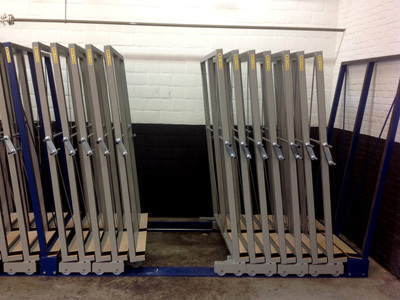 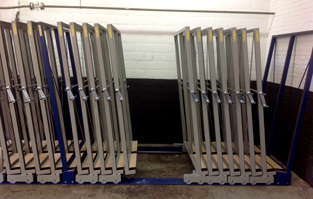 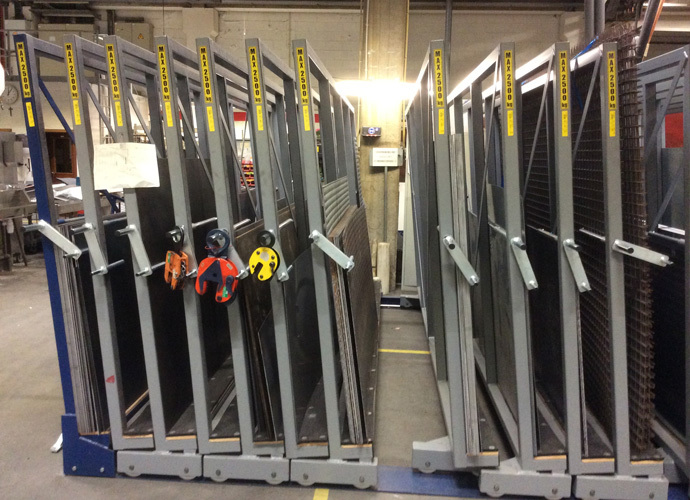 The sliding frame racks are equipped with a lever, which is used to move those frames. 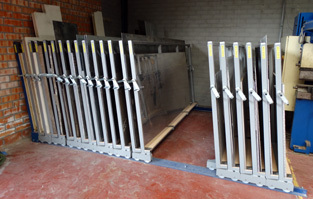 Several frames can be moved at the same time. 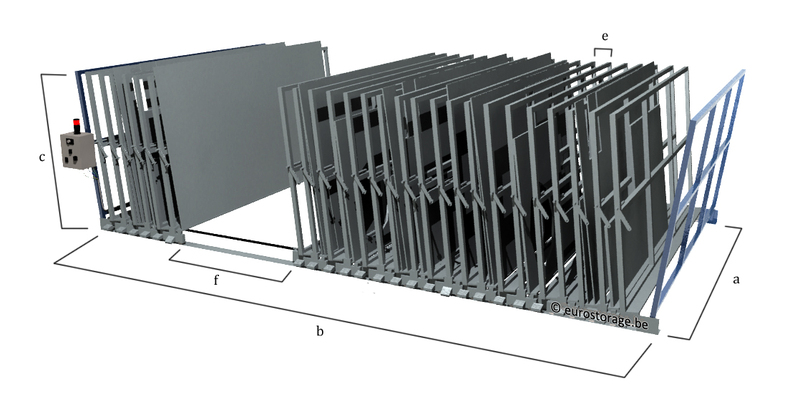 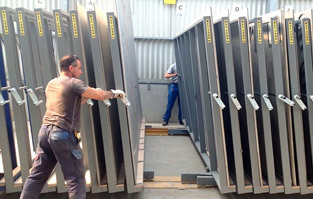 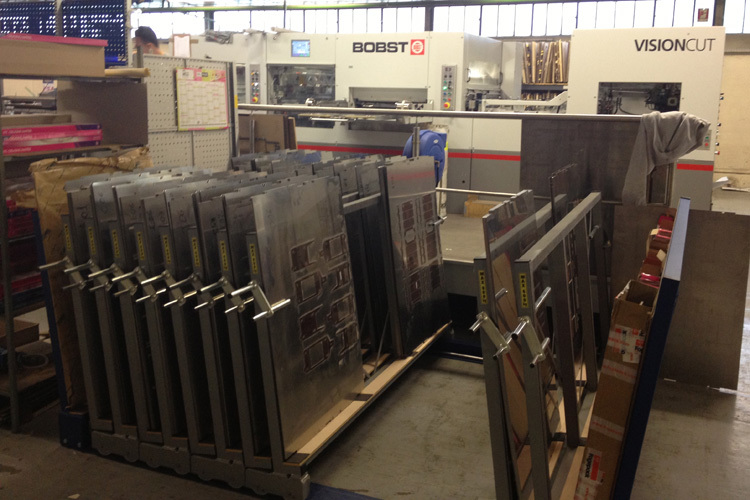 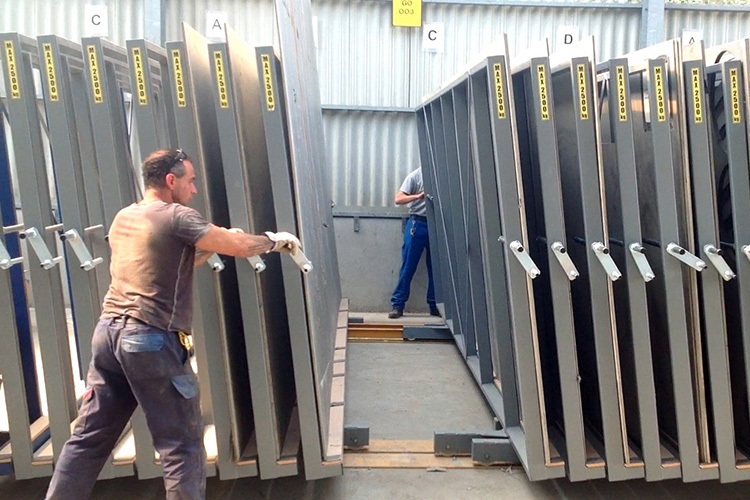 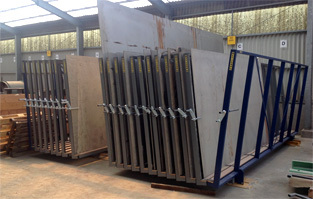 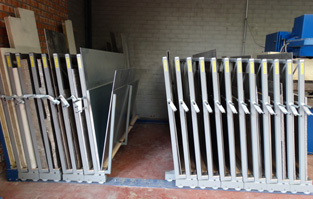 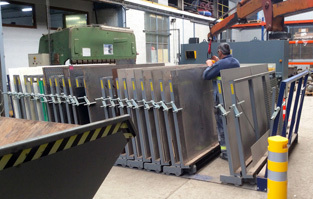 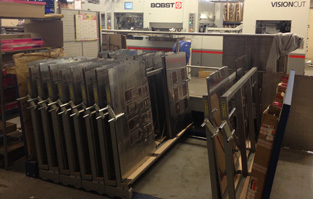 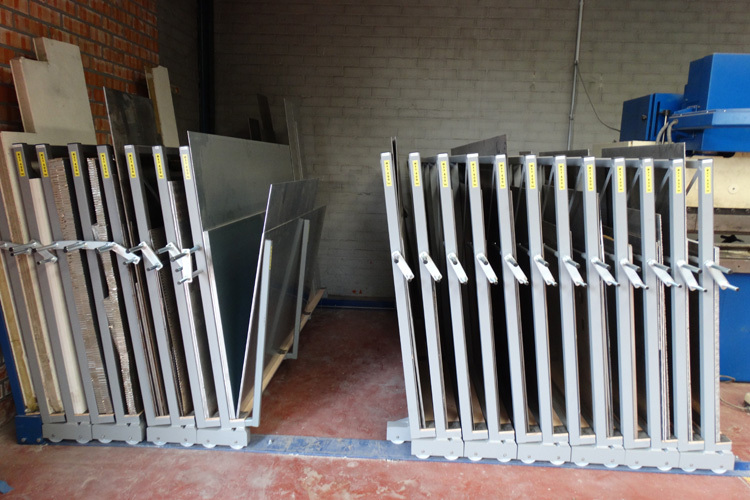 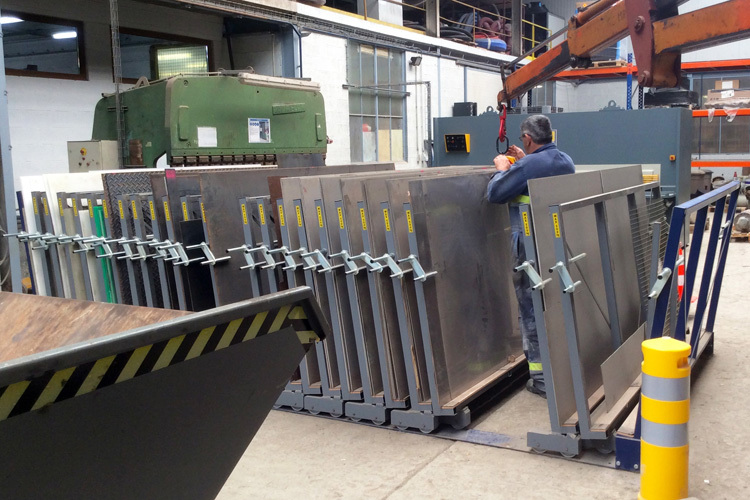 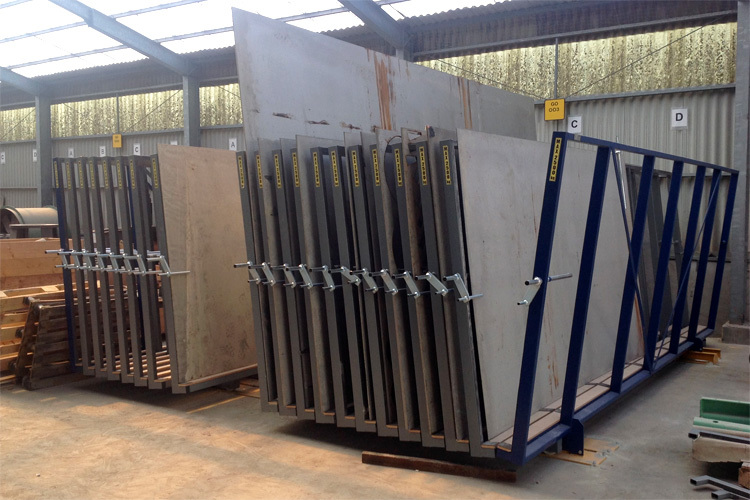 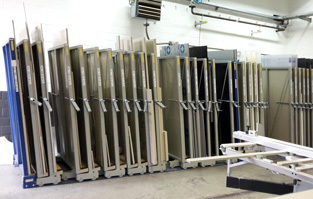 The higher the total weight of the stored metal sheets, the fewer frames you can slide at the same time. 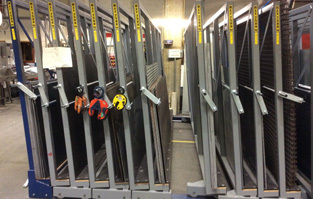 The metal sheets are also protected by the levers.